Dr. Joffe opened his dental practice in 2000. 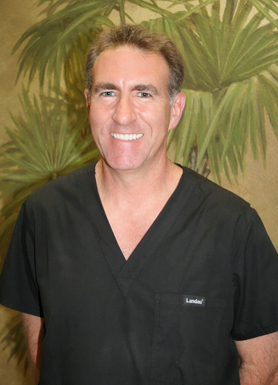 He is dedicated to providing optimum dental care for Punta Gorda and the surrounding areas. The doctor has a strong commitment to provide each and every patient with exceptional dental care, along with patience, communication and compassion. He is a member of the American Dental Association, Florida Dental Association, West Coast Dental Association, Charlotte County Dental Society and Seabreeze Occlusal Study Group. In addition he has taken many hours of continuing education courses and strives to be current on the latest dental technologies. Dr. Joffe grew up on Sanibel Island and has lived in Florida for 36 years. He went to Cypress Lake Middle and High School in Fort Myers. He is a graduate of University of Florida where he obtained his Doctor of Dental Medicine in 1988. Upon graduation he completed one year of general practice residency at University Hospital in Jacksonville, Florida. Dr. Joffe is also an avid plant lover who has a wide variety of tropical plants in his yard. These include palms, cycads, bromeliads, orchids, succulents, cacti and fruit trees. Some of his other interests include visiting National, State, and local parks to see birds, wildlife, plants, geography and other amazing nature scenes.